Soy asparagus, which is also called fuju, a popular dish of Korean, Japanese and Chinese cuisine. It can be purchased on markets or in specialty sections of supermarkets. Soft original taste of the snacks loved by many and often Russian feast adorns the bowl with soy asparagus. But how useful is a delicious dish, think about a few. In fact, with the usual asparagus, which grows in the garden, this product has nothing to do, as do soy asparagus from soybeans. They are pre-soaked in water, then grind until mushy state and from this mass squeezed soy milk. Milk then boil and remove the foam formed, dried and rolled up plait. This dry mix and is used as raw material for the preparation of fuju. 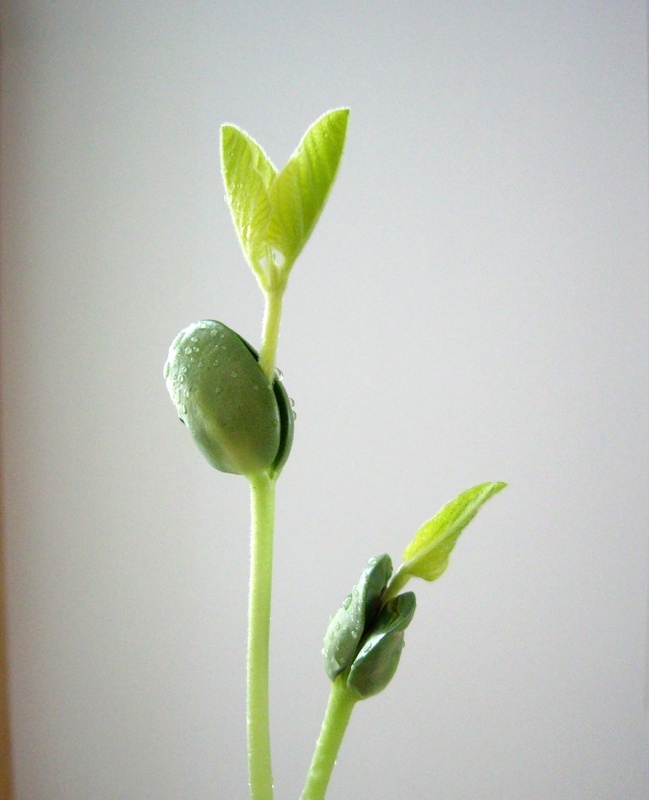 This assimilated source of plant protein is very low in calories – only 234 calories per 100 g of dry product, while protein is 45 g, of carbohydrates and fats – 20 g.
Soybeans, used to make fuju very useful plant, rich in essential amino acids, vegetable protein, vitamins and trace elements iron, potassium and calcium. Soy asparagus is perfectly digested, and the milk used to make it lactose free, which is an allergen, and cholesterol that clogs blood vessels. In soy milk and fuju also contains a number of polysaturated acids that are beneficial acting on the cardiovascular system and preventing development of many diseases. It also has a high content of plant hormones that prevent the decrease in bone mass and development of osteoporosis. In this regard, there is the risk of deviations in the sexual development of the emerging child's body, so children under 10 years have soy asparagus is not recommended, and for adults to consume should be in moderation, even though the harm from it are not proven. Contraindications for the use of soy asparagus are diseases of the stomach and pancreas. Soy asparagus broken into pieces 4-5 cm and place in a deep bowl, cover with cold water and leave for 30 minutes to become elastic. Put the asparagus, squeeze the water. Slice the onions thin half-rings and sauté it in vegetable oil until Golden brown. Put the onions from the pan. On a hot pan in the remaining oil put the chopped garlic and asparagus, pour 1-2 tablespoons of soy sauce, add some finely chopped hot pepper and a little bell pepper, cut into strips and Korean seasoning "aji-no-Moto" monosodium glutamate. Simmer, stirring for 5 minutes, place in a bowl and add a little lemon juice, stir. After the asparagus has cooled, you can serve it as snacks. In recent years, Russia has become quite popular salad that we used to call asparagus in Korean. Now, when the semifinished product for the production of this salad appeared in supermarkets, asparagus Korean-style can be prepared at home. Soy sauce – 1-2 tbsp. Actually the main ingredient of this salad is not asparagus, but a special soy prefabricated called fuju. It is produced from foam produced in the slow languor of soy milk. This foam is removed from the surface and dried. As a result, the foam acquires an elongated shape wrinkled. Fry in vegetable oil chopped half rings onion. After roasting, you can strain the oil to separate it from the bow, but this is not required. Stir in vegetable oil passed through the press garlic and add the oil to the asparagus. Vegetable oil to pour in the asparagus hot. Your specific taste asparagus in Korean largely gains at the expense of spices. Be sure to add the salad coriander and red pepper. Often the asparagus in Korean also add a flavor enhancer – monosodium glutamate. Instead, you can use a seasoning intended for Korean carrot. Today, this seasoning can be bought at almost any store. In addition to the spices, add soy asparagus in Korean 1-2 tablespoons soy sauce and 1 tablespoon of vinegar. Ordinary vinegar, but it is better to use a softer rice. Rice vinegar is also sold in many supermarkets. Mix the asparagus and wait until the salad has cooled. The taste of soy asparagus in Korean will improve if you let it stand in the refrigerator for a couple of hours. Asparagus in Korean you can cook with carrots. For this to soaked the asparagus before pouring vegetable oil you need to add finely chopped raw carrots. Soy asparagus – the invention of the Chinese. Made from soy, this product and asparagus as such is not. Rather, it is a semi-finished product made from ground powder of the soybean. Of powder brewed soy milk, foam with this milk is removed, dried and turns into familiar to us all soy asparagus. By the way, it is believed that soy asparagus is not only delicious and affordable, but incredibly useful and nutritious. The most common dish of this product – salad in Korean. Soy asparagus should break and soak up to 2 hours. Fill it with lukewarm water. Make sure the edges are peeking out of the water. Soaked the asparagus drain in a colander and shake. The taste is fresh, kind of swollen. In lightly salted boiling water drop soaked the asparagus and cook for about 5 minutes. Pour the boiling water in a separate Cup. Rinse the asparagus with cold water. 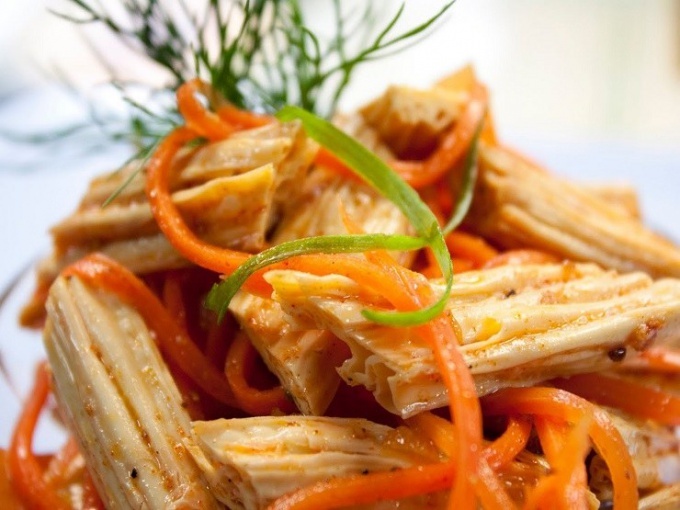 Peel the carrots and grate on a fine grater, garlic crush using a special press. Cooked asparagus cut into pieces no larger than 2-3 cm, mix with garlic and carrots. Sprinkle with red pepper. Glow sunflower oil, pour over the pepper and the asparagus. Add all the remaining ingredients: vinegar, soy sauce, salt, sugar. Mix everything carefully. If it is dry, add more vegetable oil or water in which the cooked asparagus. Put to marinate for a few hours in the refrigerator. Asparagus ready to eat. 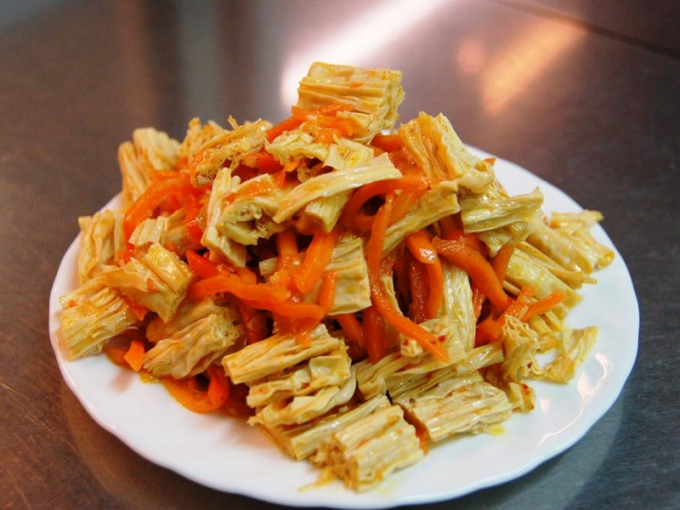 Cold dishes from soy asparagus mainly differ in the variations of the marinade (honey, soy, mayonnaise, mustard and others) and additives, vegetables, mushroom, seafood, etc. The asparagus season is very short, early spring and the early summer. But this is a very useful low calorie vegetable, rich in vitamins C and K, folic acid, dietary fiber. Asparagus not only goes well with different sauces, and perfectly marinated. And due to its delicate taste, in different marinades has different flavors. 1 / 4 teaspoon sesame oil. Before marinating fresh asparagus should be cleaned. Rinse it under running water to remove any contamination. Put on kitchen towels and Pat dry. Place on a cutting Board. The asparagus is the most delicious part - the top gentle "spikes", and closer to the roots it becomes harsh. Cut with a sharp knife about 2 - 2.5 inches from the bottom. Usually the hard part of the asparagus – the light. Place a sharp knife just under the "spear" at an angle of 45°, cut away from the stem to the upper layer. Perform the same operation on all sides of the stem. Asparagus, marinated in ginger-sesame sosaw a wide saucepan, boil water, the sunflower, put the asparagus and simmer it for 5 minutes. While the product is cooking, prepare a bowl with cold water and ice. 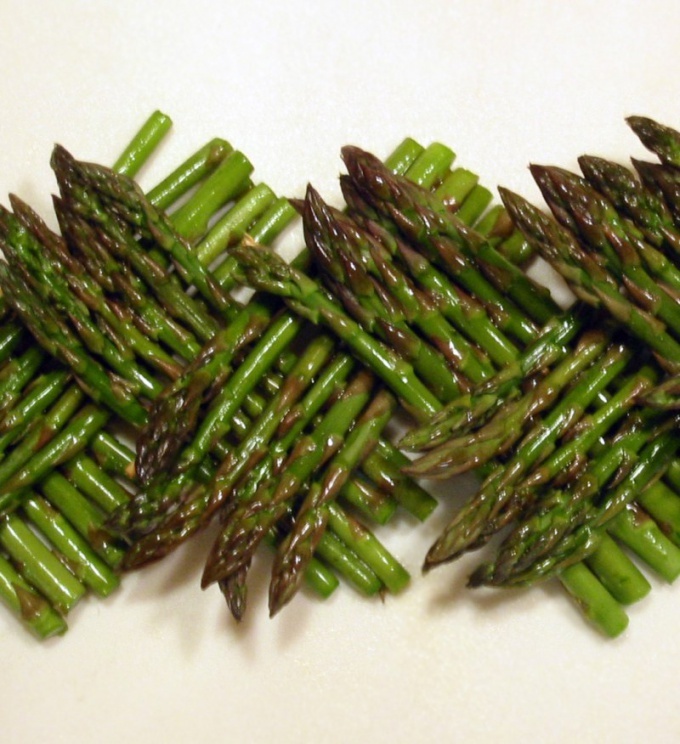 Drain asparagus through a colander and immediately immerse in ice water. Remove it from the water and let them dry out. Put in a large bowl. On a dry pan fry until Golden brown the sesame seeds. Be careful, sesame cooks very quickly and is distracted for a while as it's already burned. Peel and chop the garlic. Put in a small bowl, add the vegetable oil, rice vinegar, orange juice, soy sauce, ginger, pepper flakes and sesame oil. Whisk the marinade with a whisk. Sprinkle the asparagus with roasted sesame seed, pour in marinade and cover with clingfilm. Marinate 15 - 20 minutes. Prepared asparagus can be served, and can be stored for several weeks. Simple marinade this marinade asparagus do not need to boil. Enough to put it in boiling water for 1-2 minutes, then chill in ice water and dry. Prepare high sterilized jars in which the asparagus can be placed "spears" up so that the marinade coated the whole thing. Lay the asparagus on the banks. Make a marinade. Heat the vinegar on medium heat. It needs to be warm, but not boiling. Put salt, sugar. Peel and chop the garlic plates. Put in the vinegar. Add oil, fennel seeds, pepper. Mix well and pour over asparagus. Close the lids and store in the refrigerator. Asparagus will be ready in 6 hours.This marinade you can add a few tablespoons of Dijon mustard, the taste will benefit from this. Dry the asparagus came from the invention of Oriental cuisine. 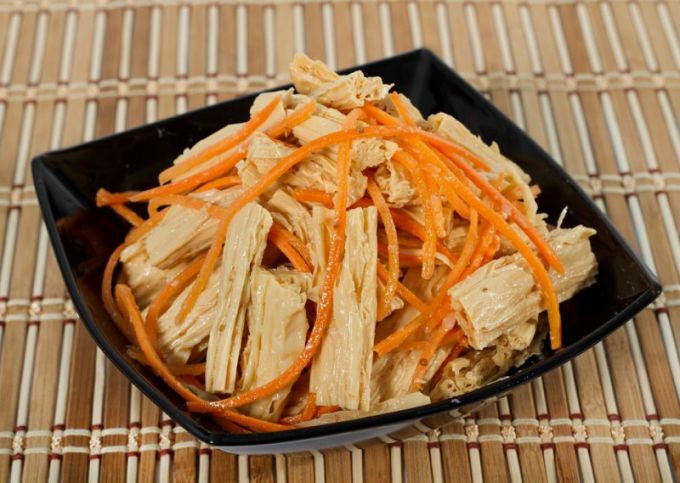 This dried tofu skin is very rich in complete protein and vitamins, so it is so fond of vegetarians. But those who do not refuse meat, meals will aid in digestion and just meet the discerning taste. - 5 tbsp Apple cider vinegar. Dry soak the asparagus in cold water for 4 hours. Drain the liquid, wash the increased in the amount of white fibers and cut into small pieces. Grate carrot on a small grater. Loosen the garlic from the skins and mash it in a mortar. Mix all the prepared ingredients. If you are cooking the asparagus in Korean for the future, take instead of vegetable oil of sesame, it is a wonderful natural preservative. Make the salad dressing. Pour vegetable oil in a saucepan and place on high heat. Put in a bowl salt, sugar, red pepper and bring contents to a boil. Add the Bay leaf, pea allspice and Apple cider vinegar and immediately remove the dish from the stove. Pour boiling sauce over the vegetables, stir and soak for 3 hours in the refrigerator. To strips soy asparagus soaked evenly, they must be completely covered with water. To be sure, to align them with oppression. Macerate dried asparagus and cut into pieces 4-5 cm in length. Peel the onions and carrots, slice thinly and sauté with green beans in vegetable oil. Cook vegetables 5 minutes, stirring occasionally with a spatula. Put them to the asparagus, and season with ground black pepper, soy sauce, salt to taste and sprinkle with chopped cilantro. Give everything a good stir and simmer under the lid for another 5 minutes. Serve the dish as a standalone dish or with rice side dish. Give the dried product as it should be swell in the water. Cut it into slices. Heat a little vegetable oil and fry in it the chopped pieces of tomato to obtain a puree mass. Put in pan with asparagus, pour the sour cream, mix all and simmer 10-15 minutes at a minimum temperature under the lid, then the sunflower, as needed, pepper and remove from heat.